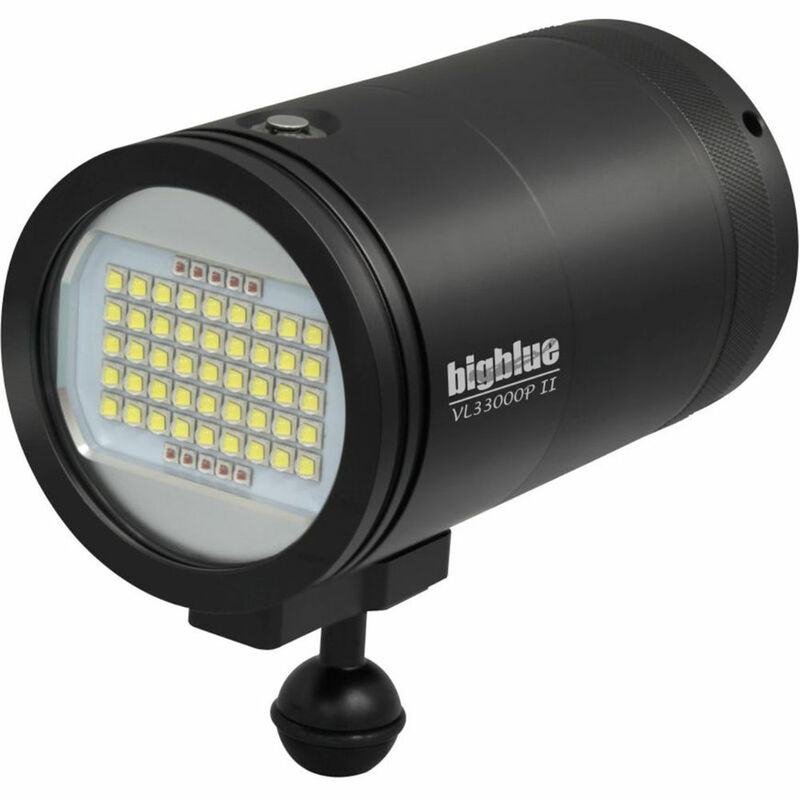 Featuring a high peak output and super-wide beam, the Bigblue VL33000P-II Video Dive Light is a highly capable torch that will meet your underwater photography and general diving needs. An array of 45 XML LEDs, powered by a rechargeable 8 x 21700 lithium-ion battery pack, delivers brightness levels of 3300, 8250, 16500 and 33000 lumens of 6500K white light, in a 160° beam. Ten XPE LEDs produce 1200 lumens of red light for staging shots. The power pack gives you a full 1.5 hours of peak output, with a maximum runtime of 15 hours on "low" power. A four-stage LED indicator keeps you apprised of your battery capacity. Constructed of anodized aluminum alloy with a tempered optical glass window, the VL33000P-II measures 5.7 x 3.3" and weighs 3.1 pounds, with a buoyancy rating of -1.3 pounds. It comes with a mounting ball, a lantern-style handle, and a hard-sided, foam-lined case to protect this valuable piece of gear in transit to and from the water.